Investing in product safety, employee diversity and carbon footprint reduction are all examples of corporate social responsibility (CSR) that can result in high praise for a chief executive — or get them fired — according to new research from the University of Notre Dame. "Higher Highs and Lower Lows: The Role of Corporate Social Responsibility in CEO Dismissal” is published in the current issue of Strategic Management Journal by Tim Hubbard, assistant professor of management in Notre Dame’s Mendoza College of Business, Dane Christensen of the University of Oregon and Scott Graffin from the University of Georgia. The study found that when CEOs choose to invest in CSR, it changes the likelihood they will be fired based on the firm’s financial returns. The research shows that the effects of a CEO’s past investments in CSR are substantial and can linger. The researchers examined all CEO transitions in the Fortune 500 from 2003 to 2008 to assess whether or not they were voluntary or the CEO was fired. 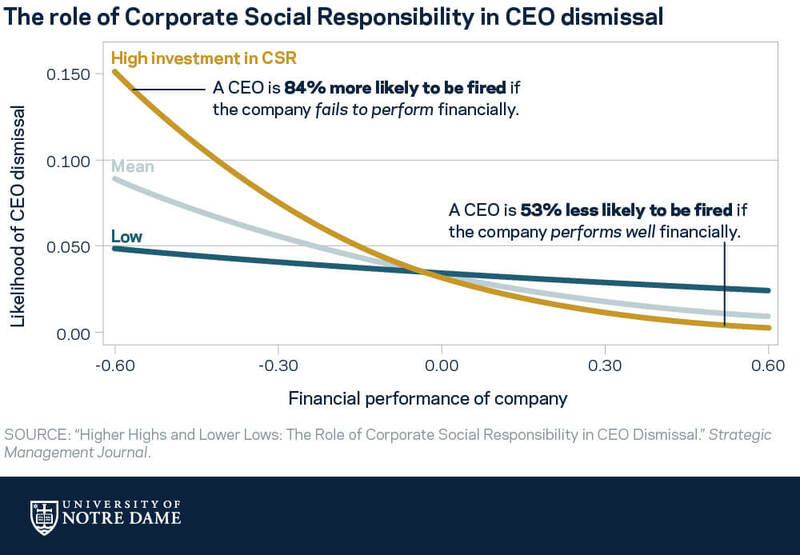 They looked at each firm’s prior corporate social activities based on third-party assessments and their financial performance, then assessed how CSR and financial returns work together to lead to CEO dismissal. Specializing in behavioral strategy, Hubbard teaches strategic management. His research focuses on the social and cognitive factors that influence behavior, examining CEO dismissals, personality, reputations, status and celebrity, performance, compensation and political orientation of CEOs. Prior to entering academia, Hubbard worked in a number of positions for Caterpillar and as a senior strategy consultant for IBM, where his clients included General Motors, Visteon, DuPont and Royal Dutch Shell. Originally published by Shannon Roddel at news.nd.edu on October 09, 2017.